Please accept my blessings. I beg to acknowledge receipt of your letter dated 11th April, 1970. Regarding your further statement in the matter of George's introduction, I think as he is not settled up in his conclusion, he wants to change it, either we should wait for his final decision or it may not be added. For the time being I am holding its publication. In the meantime, I hope you have received my yesterday's letter. Regarding the presence of God, both the theist and atheist have practical experience in two different ways. They are as follows: The atheist is hypocrite that he says there is no God. There is presence of God both for the theist and atheist. The vivid example of this presence of God both before the theist and atheist simultaneously is Lord Nrsimhadeva. Lord Nrsimhadeva appeared before the atheist Hiranyakasipu as Death and He appeared before Prahlada Maharaja the theist as the Benedictor of Blessing. So God has two features of appearance--to the atheist He appears as Death and to the devotee-theist He appears as the Supreme Beloved. The hypocrite atheist says that he does not believe in God, but he cannot say that he does not believe in death. Our definition of God is that He is great. That the atheist does not believe in God means that nobody is greater than him--he is ``God'' himself, but he is enforced to believe that Death is greater than him. In other words, Death is the representation of God before the atheist. The atheist theoretically can deny the presence of God, but the presence of God in form of Death is present before him despite his flouting. You have seen the picture of Lord Narayana--He has got four hands, two hands are for the atheist and two hands are for the theist. For the theist-devotee the Lord has the Lotus-flower or blooming peace and prosperity, and the Conchshell dissipating all inauspicity by its vibration. But for the atheist there is the big Club for hammering on the head of the atheist, or separate the head of the atheist by the sharpened edge of the Disc. In the Bhagavad-gita the Lord says that He descends in every millenium to give protection to the faithful and to annihilate the miscreants. So God has got always these two features of His authority, namely protection and death. So the atheist is hypocrite himself when he says that he does not believe in God. He has to believe in God in the form of Death. A criminal hypocritically says that he does not believe in the Government, but a civil citizen abides by the law of the Government. The Government is present therefore both for the criminal and for the law abiding citizen. To the criminal the Government is present as force of law and order, putting the criminal in the prison house and giving the civil citizen all facilities for peaceful life. So in both the cases how one can say that he has not seen God? Death is Krishna--mrtyuh sarvaharas ca aham (B.G. 10:34). ``(Also) I am Death who takes away everything.'' The atheist is liar that he does not see God. God is there for him as Death. But the atheist is so stubborn and obstinate that although he is very fearful of Death who will take away all his arrangements for sense gratification he lies that he does not see Him, and in the end he even attempts to resist Death, but he is killed as easily as anything and there is no doubt about it. This appearance of God as Death before the atheist is also the kindness of the Lord. Both God's killing and protection are the same because He is Absolute, but His mercy is shown to the atheist by killing and His mercy is shown to the theist by protecting; so both are seeing God in different features. This is the practical demonstration of the presence of God. It is everyone's practical experience to see Death. There is never any question of the presence of God, only the lying rascal atheist tries to cheat by saying that he does not see God. He tries to cheat others to believe that he is ``God,'' but he himself cannot deny God when He comes before the atheist in the form of Death. Who is gone? The complete bodily machinery remains, but the living soul has left it and the machinery stops working. It is the soul that has left. The soul was there and its presence is known by the life symptoms and when the soul departs its absence is perceived by the stopping of the exhibition of life symptoms by the body. Just as a machine is working so long the current is introduced into it and as soon as the electricity is removed the machine stops functioning. We know that there is electricity in the machine and that is making the machine run and we also perceive that the electric force is absent when the machine has stopped running. In this way the presence of the soul may be perceived directly by any thoughtful man. I think these will clarify the points for you. P.S. I am enclosing herewith the Preface of Krsna which will __ the whole thing. Please accept my blessings. I beg to acknowledge receipt of your two letters dated 4th and 7th April, 1970, respectively. So as desired by you, I am enclosing herewith check No. 108/11 for $2409.00 in favor of ISKCON Press, so please do the needful. This pamphlet will help us in our propaganda to convince people that we have not manufactured something new in the name of Krishna Consciousness. Anyone who will read this exchange of correspondences will be convinced that we hold authority. Still in your country people are under the impression that this movement is another edition of the Hippie movement. I think publication of this pamphlet and distributing them very liberally especially amongst educated circles, business men, and foundation authorities will do a great deal of help. You can consider and let me know your decision. I am enclosing one copy of the newspaper printing for your reference herewith. Regarding the preface to NOD, it will be about 10 to 12 pages double spaced typewriting. On Sunday I have dispatched one reel, tape #31 KRSNA, in which up to point 20 there is KRSNA matter and after that, I think up to point 35, there is the first portion of NOD preface. so you can get it immediately transcribed. The second part of the preface I am sending herewith already transcribed. So you join together these two portions and compose as Preface. You can leave one page for dedication. In my next mail I shall send the matter of dedication. Please accept my blessings. I beg to thank you very much for your descriptive letter dated 6th April, 1970, introducing a new chapter in the history of your country--Lord Caitanya's Birthday ceremony publicly demonstrated. Please try to serve the foretelling of Lord Caitanya in this way, and as you write to say that 5,000 people danced without being requested, this is the genuine proof about the authenticity of Krishna Consciousness movement. My students who are so kindly cooperating with me, if they rigidly stick to the routine work chalked out by me, namely chanting the prescribed rounds, observing the regulative principles, attending temple lectures and going out with Sankirtana Party, then without any fail our movement will go ahead. I understand from the letter of Bahulasva as well as from your letter that police and public both have appreciated this transcendental procession. The general public of Berkeley had a bitter experience that whenever there was a large gathering like this, inevitably there was political upheaval, protest, and window-breaking, and a general havoc. But this unique procession has convinced them that our men are very nice and they can organize a great crowd without any violence. That is a fact: if people actually want peace and tranquillity, they must support this movement wholeheartedly, and we shall execute our prescribed duties very seriously and sincerely. In this way if we are given chance, I am sure we will enact a new chapter in the history of the Western world. Please therefore always pray to Krsna to give you strength and protection, and go on with your duty straight forward. I am so pleased to learn how the crowd gave their attention to your street play. This is transcendental entertainment. And to distribute Prasadam sumptuously to the crowd is strictly in our Vedic tradition. Now the police have given you permission for continuing the program of festivals throughout the summer, so you get this permission positively. That will serve our purpose in many ways. If the people do not put any hindrance to our routine work, surely we will be able to render a great service to the state. Another thing, whether Locana das can make a nice statue for placing in the sanctuary of this place? If he can, please send him immediately to do it immediately. It is very encouraging to learn that you are so enthusiastic to sell BTG. I consider sale of BTG so valuable because in the beginning I worked for BTG day and night alone in India. I still remember the hardship for pushing on this BTG. In the beginning, when I was householder, I did not care if somebody paid or not paid; I used to distribute liberally. But when I left my household life and I was living alone sometimes in Vrndavana and sometimes in Delhi or sometimes travelling for pushing on BTG, they were very hard days. Therefore, when BTG will be published not in hundreds of thousands, but in millions, that will give me great solace. Please offer my blessings to Uttama Sloka and his new wife. He is a very good devotee. May Krsna bless them to work together happily for their mutual advancement in Krishna Consciousness. I am so glad to know that your three centers have so nicely cooperated jointly to celebrate this festival. Please offer my blessings to all the boys and girls there. Please accept my blessings. I am in due receipt of your letter dated 6th April, 1970, and I am so glad that you are now married with Madri Dasi. Please accept my blessings both of you and be happy and preach Krishna Consciousness. Sri Caitanya Mahaprabhu did not give much importance to the Vedic system of varnasrama which is very important for mundane people because Krishna Consciousness is above everything. So any suitable position in the order of our life is good if it is utilized for Krsna's service. You thought that with a wife you will be more enthusiastic, so Krsna has given you a nice wife, now you move in the European countries and try to promote centers as many as possible. Today I received one letter from Yamuna that the Amsterdam people are very much anxious to have a center of Krishna Consciousness movement there as soon as possible. So when you are expected to return back to London? or do you want to remain in Paris for some time? Recently I have drained out of my book fund $14,000, so Hamsaduta wanted to pay me another $1,500. If he sends me the money it will be a great help to my book fund. Another point is that three couples from our London temple are living in George Harrison's place, but is far away from our temple. If they cannot join regularly with the temple activities, then there might be some disturbance within. I learn that Murari and Lilavati are feeling like that. Have you any correspondence recently with London? Or you may have correspondence with Gurudasa to adjust these things. As far as possible all the devotees should live together. To live in the association of devotees is a great strength. So you try to adjust things in that way as far as possible so the devotees may live together. Here in L.A. this new temple is being renovated in so many ways. For me they have allotted a completely separate building consisting of four big rooms up and down, with a newly constructed bathroom. So I am feeling very much comfortable here and the boys are taking care of me more carefully than I require. So I hope you will be happy to know this. Similarly, all the boys are very busily engaged in beautifying the temple room. When you come here, you will appreciate everything. All the devotees, male and female are expected to move into these buildings in about 10 to 12 days. Brahmananda is taking care of publication, so things appear to be nice everywhere. Damodara came here from Washington, and they have got a nice house there which may be purchased next year. Now your first business is to see Paris center organized very nicely and see the BTG published in French and German languages. Please offer my blessings to all the boys and girls there. Hope this will meet you in good health. Please accept my blessings. I am in due receipt of your letter dated 9th April, 1970, with enclosure of George's introduction to KRSNA. Please convey my thanks to him. Regarding your staying in George's place, the first consideration is that in our temple there is no ample accommodation for all the Grhasthas. In that sense your staying in George's place with family is welcome, but your separation from the Society's activities is not very favorable. Either you should create another center in George's place or you should find out some place from where you can regularly join with the activities of our temple. I think Lilavati and Murari are feeling little perturbed on account of this. They are very much fond of temple activities. 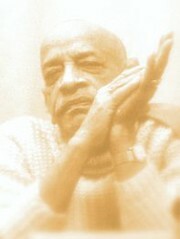 I understand that George has got a nice chapel in his house and he is also anxious to develop his Krishna Consciousness, so it is not necessary that he has to become my formal disciple, but in order to develop his Krishna Consciousness, he should give us some opportunities to develop a duplicate temple in Oxon. Our staying in John's Tittenhurst garden was a failure because John wanted to utilize the labor of our men without giving us proper facilities for developing the temple. But I do not know whether he is following the four regulative principles. That will help him very rapidly. So for the time being you remain as you are and you also do the same thing, and if possible as suggested by you, Murari and Lilavati can open a center in Oxford. Oxford is a good place for our Krishna Consciousness movement. Formerly when I was there, we saw an old church for the purpose of purchasing it. I think Mukunda had some correspondence about it. Besides that, what are you going to do about Rathayatra? Both you and Murari are good carpenters. So I shall be glad to learn what is your program about Rathayatra. Regarding your need of engagement, then you have to join Sankirtana Party. Your aptitude is to be engaged in constructing something for Krsna. The best thing will be to engage yourself in carving Lord Caitanya's statues. That will be good engagement for you even in George's house. Is it not possible to have a small temple in George's house so you can engage in temple worship? That is necessary. If there is a small temple there, then you and your wife and others can be nicely engaged. I think George does not require to become my formal disciple because he is already more than my disciple. He has sympathy for my movement and I have all blessings for him. He can easily spare that chapel for developing it into a nice Krishna Consciousness temple. We do not want any proprietorship right, but we want simply to utilize the nice place into a nice temple. Our men will take charge of maintaining the temple, so what is the objection about his sparing this nice place for turning into Krishna temple. My idea is that you six boys and girls who have gone there remain there and help George as far as possible, but you maintain a regular temple there so that people may come see an ideal place of worship and surely that will be a great advantage for George and the visitors who come there. I have received one letter from Munich, the copy of which is enclosed herewith. If George simply spares that chapel to us it will be a great service to the neighboring people and visitors. We shall turn the chapel so nicely that everyone who comes to see will be Krishna conscious person. Yes, I always think of your little girl, she is so nice. Sometimes I think that I left my home leaving aside all children and grandchildren, and Krsna is giving another batch to whom I am becoming attached. But this attachment is nice because the center is Krsna. I always narrate the story of your daughter when she was dancing on the platform of the law college and she obliged all other law students to imitate her dancing. Anyway, just raise this girl in full Krishna Consciousness and she will be a great preacher when she is young. During Rathayatra ceremony I will suggest that Lord Jagannatha be carried from London to Oxon in Their chariots and in procession and Lord Jagannatha live for 8 days from the 5th to 14th July at the chapel house of George. And for eight days there should be continued festivals which means Kirtana and distribution of Prasadam. During this 8 days time, George should invite all his friends and guests and they should be informed about the necessity of Krishna Consciousness movement. The chapel house should always be nicely decorated with leaves, flowers, and lights; and then after completion of 8 days stay, Lord Jagannatha shall return back in procession to London temple. I think George can afford to expand for this whole week celebration at his house. That will be practical understanding of Krishna Consciousness. You can suggest this idea to George on my behalf. I thank you very much for your letter . . .
As you have liked to know more about the temple, the worshippers, and the scriptures, I beg to inform you that this Krishna Consciousness movement is based on the Vedic scriptures. Veda means knowledge and there are two kinds of knowledge--one mundane and another transcendental. Vedas are considered to be originally transcendental because they are coming from the platform which existed before the creation. This transcendental knowledge was impregnated in the heart of the first created living being, and then he distributed the knowledge both for material and spiritual purposes. This Vedic knowledge was stated in the Atharva Veda. Later on, just on the beginning of this millenium, the Kali yuga, Vyasadeva, who is the supreme authority of Vedic knowledge, considering the degraded condition of men in this age, divided the whole Veda into departmental knowledge and some of his disciples were entrusted with a particular type of departmental knowledge. In this way the whole Vedic knowledge developed into four Vedas, 108 Upanisads, 18 Puranas, then summarized in Vedanta Sutra, and then again to benefit the less intelligent class of men like women, workers, and the degraded descendants of the higher class he made another fifth Veda known as Mahabharata or the great history of India. The original Bharata and modern India are not the same. The original Bharata means the whole earthly planet. Gradually being sectioned, the modern India is only a fractional part of the original Bharata. So the knowledge is distributed in so many departmental Vedic knowledge, but the whole process is aiming at God-realization. The living entities within this material world are supposed to be rebellious conditioned souls who disregarded the order of the Supreme Lord, and they lost their spiritual kingdom. It is something like Milton's idea of ``Paradise Lost.'' This material world is created, developed, maintained, produces many by-products, then gradually dwindles, and at last it is dissolved or annihilated. The spirit souls or living beings, are by nature eternal. This condition of life for the living beings are by nature eternal. This condition of life for the living beings, namely to go through repeated births and deaths, is unnatural for him. Therefore the whole Vedic knowledge is devised to regulate the life of the living entities not in the animal form of life, but in the human form of life, so that he can fulfill his material desires, but at the same time he becomes elevated to his original spiritual position. This process of evolution from the lowest aquatic life up to the stage of brahminical culture is delineated in the whole Vedas. This is called knowledge, and when one is liberated from the material contamination, the same knowledge further advanced becomes transcendental knowledge. This process of elevating oneself from different platforms of understanding to the highest status of life is called religion. According to Sanskrit language, religion is not a kind of faith, but it is a prescribed form of duties to be discharged by respective human society, ultimately rising to the platform of Krishna Consciousness or God-consciousness. The first class religion is therefore that which teaches human being love of God because religion means to understand one's position in relationship with God. This God-realization also depends on three phases of life. When God-realization is there distinguished from material realization, this is called liberated stage of transcendental enlightenment. The next stage is to realize God everywhere in His localized aspect, and the highest stage of God-realization is to know Him as the Supreme Person--all powerful, full of all riches, all reputation, all beauty, all wisdom, and all renunciation. For the further understanding of this religious process I would recommend you to read our three books namely Sri Isopanisad, Bhagavad-gita As It Is, and Easy Journey to Other Planets. When you have finished them, you can read Srimad-Bhagavatam and Teachings of Lord Caitanya. Besides these we have many other books and our ``Back to Godhead'' magazines, in which we are fully describing about this religion only. So you read them one after another, and whenever there is a question you may write to me and I shall be very glad to answer it as far as possible. I am so pleased to learn that you are so impressed with our activities and you are so eager to learn about religion. Please accept my blessings. I beg to acknowledge receipt of your letter dated 6th April, 1970, together with two checks for $1015.79 and $150 respectively and thank you very much. New York is the best city of your country, therefore the prospect of preaching in New York City is especially very great. I began my preaching life in this city, therefore I have got some special attraction for New York. I wish, therefore, that a fitting and imposing temple may be situated in New York. I understand that you are trying your best to secure a house, so in consultation with Brahmananda you can do it very earnestly. Regarding Sankirtana Parties in New York, Krsna will provide devotees, don't be worried. Krsna can provide anything and everything within a moment, but He waits to test a devotee. And when the devotee comes out successful from the test, He gives him all opportunity for devotional service. So everyone of you should go on with the Sankirtana Party and gradually Krsna will send more and more devotees to join you. Please accept my blessings. I am in due receipt of your letter dated 6th April, 1970. Just before receiving this letter, I have sent another letter to you dated 9th April, 1970.
Who told you that I am a citizen of America? I cannot even apply for citizenship unless I have stayed here legally for at least five years. I am admitted here as permanent resident so that I can go to India and come back again without any visa or passport for this country. There are many Indian business people also who come and go from India and U.S.A. and vice versa. So at my present status I can come and go to and from India without any passport or visa--that is my position. My India citizenship is valid. If I adopt U.S. citizenship, then I renounce my Indian nationality. So at the present moment I am full Indian national. In technical language I am known in the Immigration Department as ``alien,'' not as citizen. So you can inform this to Mr. Ghosh. You wanted to take citizenship of India. So why don't you take it? What is the difficulty in this matter? Cannot Mr. Ghosh help you in this connection? You have written nothing about the Bhavanipur land. I shall be glad to hear from you what happened to this transaction. I think you will have to take a formal sanction from the Reserve Bank of India on my behalf, and Mr. Ghosh knows it well. If it is necessary to take sanction, I have enclosed herewith the application which you may use if necessary. I have already advised Brahmananda to send you books and magazines by surface freight, and that will be easier to distribute our books and literatures locally. You have written to say that they must also write to Madhava Maharaja. I cannot understand what do you mean by this. They are not known to Madhava Maharaja, so how they can write directly to Madhava Maharaja? Neither I wish to overburden Madhava Maharaja with further addition of my disciples in his temple. This is a very delicate point. Better you can ask Madhava Maharaja whether he is willing to receive further members of our camp in his temple. Therefore, I wanted that when we get our own place, the Brahmacaris may go. Regarding long visa, as you say that you can arrange or advise how they shall apply for it. Sriman Nanda Kumar Brahmacari and Jayapataka Brahmacari are ready to start. So I do not know what to do in this connection. I do not think that writing to Madhava Maharaja for their accommodation from here will be right thing. Better verbally you can ask him whether he will allow two other Brahmacaris to stay there. The procedure is quite admitted that you do not accept invitation in the fashionable meetings and you lecture exclusively. That is very nice. You do not allow anyone to touch your feet--this is very good attitude--but if they want to insist on touching your feet and there is no other way to avoid it, you can simply remember your predecessor Acaryas and Spiritual Masters and accept them and return namaskara with folded hands. That is the Vaisnava etiquette. I hope all points inquired by you are cleared, and now you can do the needful. Hope this will meet you in good health. Please accept my blessings. I beg to acknowledge receipt of your two letters dated 30th and 31st March, 1970. Regarding religion, not only at present, but also in the past, all of them are described as pseudo-religions. The Bhagavat has condemned such pseudo-religion in the second verse of the first chapter, first canto. Under the spell of material energy, man is forgetful of his eternal relationship with God. They create some religion to derive some material benefit as they create political organization for mutual undisturbed sense gratification. So religion is also a part of that concept of life. As such, in most of the religions you will find some instruction on morality and goodness, and God consciousness is superfluous. So except Krsna Consciousness or Bhagavata Dharma or religion of the Bhagavata, any other system of religion is only pretension, that is the fact. It is not therefore surprising that your impression of the meeting of the Jews and Christians, where you had opportunity to speak, was that they were lacking so much in God-consciousness. So far we are concerned, our principle is to live with God as actual fact, and not to make God a supplying agent. Our process is different because we want to supply God everything--whatever we have got and whatever we have not got. Regarding your need for men, Krsna will give you many assistants, don't worry. I have ordered for you big Radha Krsna murtis for which you will have to donate $400 to my book fund. All centers are selling our literatures very nicely, you also try for it. Whether you have got sufficient stock of all our books--Bhagavad-gita, TLC, Srimad-Bhagavatam, Easy Journey, etc.? If not, then get them from Brahmananda. I have not yet received the package of matched cloths which you have sent, but when it is in my hand I shall properly utilize it as directed by you. Please accept my blessings. I beg to acknowledge receipt of your letter dated 1st April, 1970. I am very glad to know that you are busy now in the press assembling the new book Krishna Consciousness the Topmost Yoga, that is very nice. I am sending $2,400 next week as Advaita has requested. Regarding the proposed marriage of Manmohini and Sridama, Yes, I have already sent Sridama sanctioning this marriage and offering my blessings. Subala has already got practical experience, he has performed two marriage ceremonies and he has sent me a xeroxed copy of the procedure which I have approved. I am enclosing herewith one copy and you can perform the wedding in your temple. Everyone, at least all the presidents, should be experienced in performing marriage ceremonies. I am also glad to learn that you are engaging Visvakarma to construct an enlarged altar for the new Deities. That is very nice. Then when the Deities arrive you can send the $400 to me here for my book fund. Regarding the pictures from the first volume of KRSNA, they should be all sent here and I have advised Brahmananda in that connection. Regarding your first question, there is no difference of the svayamvara ceremonies of Draupadi and Laksmana, they were almost alike. The only difference was that the fish was covered with a cloth in the case of Laksmana, but the fish was naked in the case of Draupadi. Regarding your second question, when blood stands for some time it coagulates and the coagulum subsides leaving the serum or water. So the lakes then become full with water. Regarding the third question, generally these airplanes are constructed in the shape of a swan with wings and beak and tail, etc. and on the back they put a dome like on a chariot for sitting and driving. I have drawn you one picture to convey the idea, please find it enclosed herewith. You are at liberty to make many questions like that. So long I can, I must make answers to your questions, but when I fail, I shall ask you to excuse me. Please accept my blessings. I am so pleased to receive your letter dated 4th April, 1970, and I am very glad to read the contents. I am very glad that you are going to marry Manmohini Dasi and I have got my full sanction and blessings for this unity. Nanda Kisora and his wife and yourself and your wife, four together, organize the center in Providence which is already wonderful and by your propaganda of Krsna Consciousness it will be heavenly. As soon as a center is open and my disciples conduct it nicely, it gives me Vaikuntha bliss. Vamanadeva is doing very nicely in St. Louis, and I am sending herewith some pictures of his activities. So Bali Mardan and Upendra are doing in Sydney also. All these newses are to me life-giving ambrosia, so the more you open branches, the more I increase my duration of life. Therefore, if you all my students want me to live for some days more, go on opening nice branches as many as possible. Be happy in Krsna Consciousness and keep me informed about your activities. Thanking you once more. Hope this will meet you in good health. Please accept my blessings. I thank you very much for your burfi. It is so nicely made. Lest it go out of stock, I am eating only a very little quantity daily. But how you have made it, if you send the formula, maybe Nanda Kumar or Devananda may be able to prepare it. I hope you are taking care of the Deities with greater attention, and teaching your younger God brothers and sisters to follow the Arcana bidhi. As we open many branches, we shall require many devotees like you to take care of the Deities very nicely. So be happy in Krsna Consciousness and I shall pray to Lord Krsna for your greater achievement in devotional service. Thank you very much. Please accept my blessings. I have received the karatalas, but it is completely hopeless. The man has cheated us cent per cent, but there is no way to rectify it and we shall wait for future to get the right thing. I hope everything is going on nicely in your temple, and please keep me informed regularly of the activities. I have not heard from Syamasundara. for a long time. I sent him one letter of which I have not received any reply as yet. Please remind him. Please offer my blessings to all the devotees. RE: My savings account No. 12410 with you. Please accept my blessings. I beg to acknowledge receipt of your special delivery letter dated 6th April, 1970. Regarding the prayer verses, I have sent you immediately the Bengali prayer book and you will find all the prayers of Acaryas' there. I have also sent you one copy of Panjika which will help you to find out the list of names of Acaryas' Appearance and Disappearance Days. If you can, you can prepare conveniently the Panjika or ISKCON Almanac for next year, but not now, you have got many engagements, this is for leisure hours. Regarding the new prayer addition ``Namaste sarasvate devau. . .'', I think you can change the word ``devau'' into ``deve'' to make it compatible with sarasvate. Sarasvate is locative, so you can change the word to ``deve'' to make it fit, or it can be made ``devam''. ``Devam'' is the accusative singular and ``deve'' is the locative singular, so both can be used, but I think ``deve'' will be most fitting word. Meaning for a person who has taken shelter of the lotus feet of Lord Murari (Krsna), which are the shelter of all great souls and are famous for being the reservoir of all piety, this great ocean of material existence shortens like the pit-hole created by the foot of a calf and for him the supreme abode of the Lord is quite fit place for living, but not this miserable material world where there is nothing but danger in every step. jagannatha-svami nyayana pathagami bhavatu me. Translation: The sound which indicates a particular subject or word should be the first case ending or nominative case. So in your last correction of Krsna tape number 27, on page 11 you have mentioned ``Sannyasin'', ``Gosvamin'', ``Mayavadin'', ``tridandins'', ``svamins,'' etc. They should be corrected without ``n''s like ``Sannyasi'', ``Gosvami'', ``Mayavadi'', ``tridandis'', etc. So in future, only the first case endings should be used, not the sound, that is the rule. Regarding your other arrangement, I have already replied you in my last letter, and as you are trying your best to make our preaching propaganda as most authoritative on the Vedic culture, Krsna will certainly help you. I think the book which I have sent you will help and the balance Krsna will teach you. We should always remember at the same time that we want to understand our business only and not try to become very scholarly because time is very short. But some of us, as you are trying may proceed on as far as possible on the scholastic way. I think the scheme of publishing Srimad-Bhagavatam chapter-wise decently is good, so that it will keep all of you engaged and the press going on. When all the chapters of the canto are printed, they can be assorted in one book form for hard bound publication. The size of the book must be symmetrical of my present Bhagavat editions--that is to say 6 1/2 inches by 9 1/2 inches. I think the present composition of the NOD is not to my standard; so whatever is done is done, but the Srimad-Bhagavatam must be to the standard size. If the books are printed in standard size (6 1/2 x 9 1/2), then the chapter pamphlets may be easily bound into a hard cover when all the chapters of the canto have been printed. Regarding your 8th point, I am enclosing a corrected xerox copy of the text for aratrika prayer by Srila Bhaktivinode Thakura, please find.